2017-2021 Board of Director Elections Complete! Newsletter #13 was just sent out if you are a paying member and didn't get yours - please get with us to get your e-mail address updated. Otherwise we hope you all enjoy what we have put together for you! Paw Print Genetics announces publication of their investigation of genetic diseases in a rare dog breed known as the Drentsche partijshond (Drent) or Dutch partridge dog. In collaboration with the Drentsche Partijshond Club of North America, the Spokane-based company studied 13 Drents for 142 different mutations known to occur in domestic dogs. In this study, two mutations were identified: three dogs were carriers for hyperuricosuria, a condition that can cause bladder stone formation and four dogs were carriers for von Willebrand disease, type 1. In addition, three dogs were found to be at-risk for von Willebrand disease, and may have mild to moderate signs of disease including easy bruising, nose bleeds or bleeding after losing their juvenile teeth, and prolonged bleeding after surgery or trauma. For questions about the study or to learn about the genetics of your dog, please contact Paw Print Genetics athttps://www.pawprintgenetics.com/ or 509-483-5950. So it has been a long time coming. 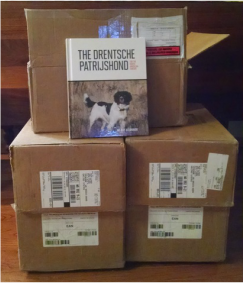 IN fact, it has been nearly eight years in the making, The Drentsche Patrijshond for the North American fancier is no ordinary breed book. It is a treasure trove of information gleaned from some of the most influential Drent experts in the world and the only guide on the breed to be written in English. Written in an easy-to-read conversational tone, it covers all aspects of the Drent that are of particular interest to North Americans and is illustrated with stunning, full-color photos of Drents at work and at play. 2012-2013 Board of Director Elections Complete! On November 17, 2012 the North American Breed Standard was accepted by de Vereniging de Drentsche Patrijshond. Today is a historic moment for the DPCNA! De Vereniging has accepted the DPCNA'sproposal for a North American breed standard which includes additional historical information and judging points which have been deemed as being very accurate! “A rumpled shirt, a growth of whiskers, a heart of gold and a sharp mind – these characteristics are the essential flavors of Mark in our memories. He loved his wife, his land, his friends, his dogs, his teams and his cards. He wanted to help in any way he could and loyalty was his essential strength…his unwavering devotion to Lauren. His generosity and desire to share all the things that he enjoyed made him seem tall despite his short stature and his amiable spirit made him a pleasure to be around. He was essentially a good man, a good friend, a good sport. We will miss him terribly”. Jerome Mark Janson, known as Mark, age 67, passed away in the arms of his loving wife Lauren on Thursday morning, August 16, 2012 in Glorieta, NM. . He was a very loyal friend, a devoted husband, and a loving father and grandfather. s Karen Janson Herr and Kim Buchanan, son Scott Janson, sister Sandi Selk, brothers Ken and Harvey Janson, and 7 grandchildren: David, Shaunde, Anthony, Nicholas, Brett, Amanda and Jarrett. 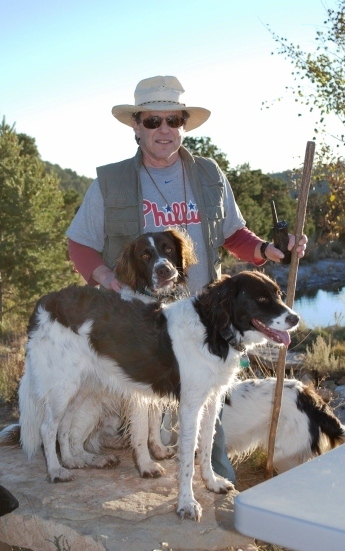 Mark was an avid sportsman, both as a participant and a spectator. He was a long-suffering and faithful fan of both the Philadelphia Phillies and the Philadelphia Eagles. He was involved in both football and baseball from a young age, organizing and playing in many different baseball leagues. Mark's physical speed was an asset in all of his sports endeavors, but was secondary to his quick wit and ready smile. If you needed a good laugh, you could hang out with Mark. He was not only gifted intellectually, but had a huge heart. He graduated from Philadelphia's Olney High School in 1963 and from the Temple University School of Pharmacy. Mark and Lauren moved to the Santa Fe area from Pennsylvania in 2003. They moved to their rural paradise, atop Glorieta Mesa, in 2005. Mark loved the land he shared with Lauren, and felt peaceful there, and whole. He enjoyed hiking their land in all seasons with Lauren and their dogs, their family, and their friends. He finally felt at home. Mark was a true adventurer, who lived life to the fullest. He loved piloting small planes and had traveled the world in huge ones. He enjoyed equally adventures in the outdoors and plazying poker indoors. He was considering another career, in poker. Mark was a model train enthusiast, and had a giant, always-under-construction model train setup in his home. Mark deeply loved animals, especially his favorite dog breed, Drentse Patrijshond, Dutch partridge hounds. He and Lauren have six of this mid-size, friendly breed. His life ended so quickly, but in his life he managed to touch many people and accomplish many goals. He will be deeply missed and never forgotten. In lieu of flowers, donations may be made to Heart and Soul Animal Sanctuary.www.animal-sanctuary.org.